Water may seem benign, but in huge quantities it can be an enormously destructive force. When floods occur they bring with them numerous problems, ranging from the physical impact of water damage to the problems of disease and famine that can follow such disasters. The causes of flooding are varied, but the effects of most causes can be managed if not prevented. Unusually heavy weather at the source of a river can lead to vast amounts of water draining into the water table. The water table of a river is the area from which it gathers water, so if an unnaturally high level of water is draining into this area, this will lead to similarly high levels of water in the river. As more and more of the river’s tributary streams join the river, this effect is amplified until the amount of water reaches a critical level; the banks – or the natural flood plain – cannot hold such a volume and it spills over. This often occurs at lower reaches of a river in areas of habitation, causing extensive damage. Sudden thaws in mountainous areas can lead to dangerous increases in water draining into the water table. A dramatic temperature increase after a particularly cold winter causes the ice and snow on mountaintops to melt and drain into valley rivers. This effect can cause similar damage as heavy rainfall. 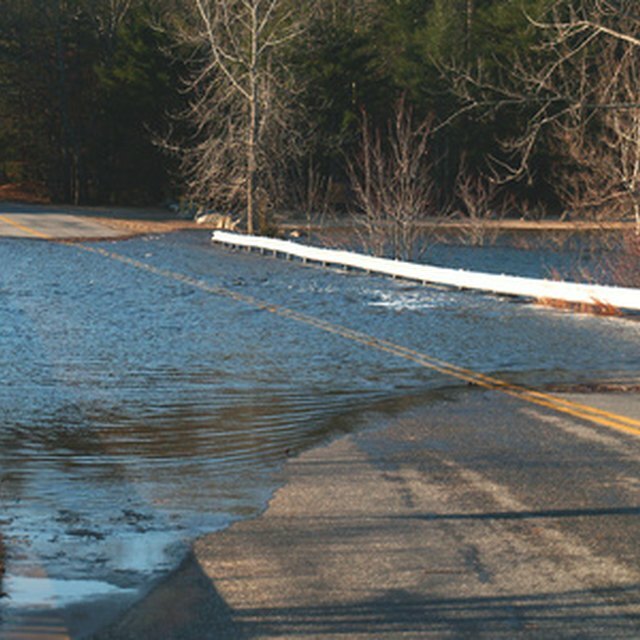 Flooding is not always caused by natural occurrences; human intervention in natural river courses can have a huge effect on the likelihood of flooding. For example, landowners further up the stretch of a river erecting illegal dams to protect their farmland can have catastrophic effects farther down the river when this unalleviated pressure is brought to bear on people’s homes in more densely populated areas. In 2008, "Time" magazine ran an article which pointed the finger at the Army Corps of Engineers' incompetent damming policy increasing water pressure on the Mississippi, stating, "500-year floods seem to be hitting the Mississippi every 15 years." Major trauma at sea, such as earthquakes or even heavy coastal rock falls, cause enormous walls of water known as tsunamis, which can sweep across huge expanses of ocean at over 600 miles per hour. These enormous waves cause an enormous amount of destruction when they come into contact with a landmass and cause catastrophic flooding. The sheer amount of water contained in a tsunami, combined with the velocity of the strike, means that these types of disasters cause enormous loss of life. A tsunami was blamed for wiping out the ancient Minoan civilization on the Greek Island of Crete, while the Southeast Asian tsunami of 2004 left 150,000 people dead or homeless. In 2011 a tsunami struck Japan, leaving more than 10,000 people unaccounted for in one coastal town alone. National Geographic: Deadliest Tsunami in History? Salgado, Julia. "The Causes of Floods." Sciencing, https://sciencing.com/causes-floods-8108002.html. 19 April 2018.